Tata Motors passenger and commercial vehicle total sales (including exports) in October 2016 were at 52,813 vehicles, a growth of 21%, over 43,486 vehicles sold in October 2015. The company’s domestic sales of Tata commercial and passenger vehicles for October 2016 was at 46,480 nos., a growth of 19%, over October 2015. Cumulative sales (including exports) of the company for the fiscal was at 311,629 nos., higher by 9% over 286,048 vehicles, sold last year. The company continued to witness year-on-year growth in certain key segments in October 2016, with the company’s passenger vehicles growing by 28%, recording highest sales in last 4 years. The Company’s Commercial Vehicles business recorded the highest sales in this year, grew by 15% and LCVs continued to grow by 21%, due to strong demand in festive season. The MHCV sales reversed the trend and grew by 9% after four months of decline. The Export business grew by 39% on account of strong demand for Tata Motors’ commercial vehicles. In October 2016, Tata Motors passenger vehicles, in the domestic market, recorded highest sales in the last four years at 16,311 nos., with a growth of 28%, compared to 12,747 nos., sold in October 2015. The passenger car sales continued its growth momentum due to strong demand for the recently launched Tata Tiago with retails showing an increasing trend. Cumulative sales growth of all passenger vehicles in the domestic market, were 88,976 nos., a growth of 15%, compared to 77,465 nos., in October 2015. The Commercial Vehicles domestic business recorded highest sales this year, in October 2016, in the domestic market with a growth of 15%, at 30,169 nos., compared to October 2015. While the sales of Light Commercial Vehicles, continued to grow strongly in the domestic market by 21% over October 2015, M&HCV sales saw a strong recovery and grew by 9% in October 2016 after four months of decline from June 2016. MHCV demand saw an improvement across various sectors including construction, auto logistics, cement, petroleum products and FMCG / consumer durables segments. Cumulative sales of commercial vehicles in the domestic market for the fiscal were at 184,851 nos., higher by 5% over last year. The company’s sales from exports was at 6,333 nos., in October 2016, a growth of 39% compared to 4,569 vehicles sold in October 2015. The cumulative sales from exports for the fiscal was at 37,802 nos., higher by 15%, over 32,770 nos., sold last year. This festive season has brought double delight for Tata Motors. It gives me immense pleasure to share with you that we have recorded highest sales in the last 4 years with a growth of 28% in October 2016, compared to last year. While we have been growing month-on-month, the festive season has further ushered in strong growth impetus for us. The Tata Tiago continued to receive strong response and Tata Zest retails were highest ever since launch, during this festive season. All our other products also saw increased traction in the market. Also, we secured the second highest score in the J D Power 2016 Syndicate Customer Service Index Study, which is the highest increase in score in the industry, this year. 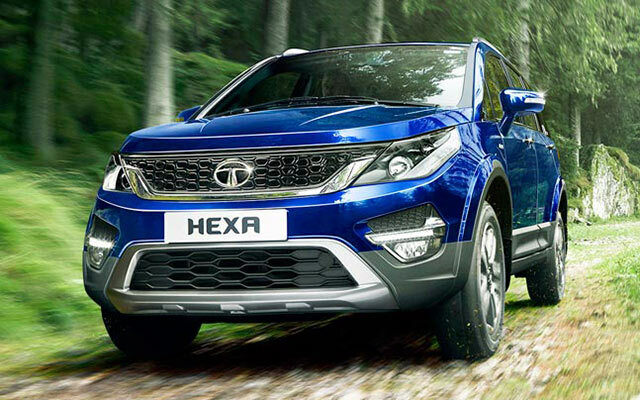 We are also receiving encouraging feedback on the Tata HEXA and are gearing up for the launch in January 2017. We remain committed to offer our customers an exciting product and service experience with best-in-class purchase and after sales service across our dealerships. These achievements are a proof of our consistently focused efforts towards achieving our vision to be among the top 3 in the domestic passenger vehicle market, till FY19. MHCV sales recovered to grow by 9% in October after 4 months of negative growth.